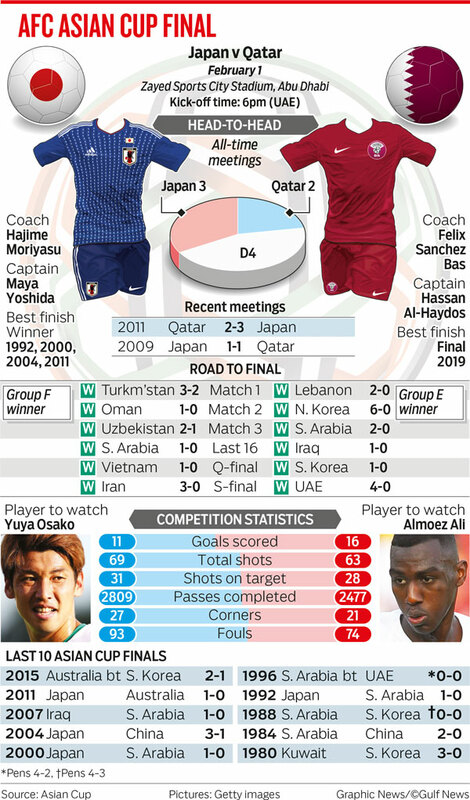 Abu Dhabi: Japan coach Hajime Moriyasu is chasing history. He is at the cusp of becoming the first man to win the Asian Cup both as a player and coach, if his side goes on to win their fifth title beating Qatar on Friday at Zayed Sports City Stadium in Abu Dhabi. The action starts at 6pm. Moriyasu, who lifted the title in 1992 as a player, said he is all focused on the task at hand and individual success was not at all his priority. Moriyasu rates opponents Qatar as fierce competitors. The Samurai Blue will have to be wary of Qatari striker Almoez Ali, who has scored eight goals and is currently at level with Iran’s Ali Daei (in 1996) as top scorer in a single tournament. Four of his assists have come from Akram Hassan Afif and the duo will be the main thorn in Japan’s side. Qatar have also kept a clean sheet in every game so far this tournament and it will be a test for Japan’s strike force led by Osako Yuya to get past goalkeeper Saad Al Sheeb. “It will be a very tough match and we know they are very strong opponents,” said Moriyasu, whose side defeated Iran 3-0 in the semis for a place in the summit clash. “We have already played six matches. It’s one more that we need to do. We are doing our best preparation so that our players can have the best performance tomorrow on the field. Qatar’s success also has a lot to do with their Spanish coach Felix Sanchez, who has been with the team for over six years starting with the Under-19s. However, Moriyasu is not perturbed and is backing on his team’s ability to adapt to the situation according to the strengths of the opponents. Japan’s star Maya Yoshida was also optimistic about his side’s chances and felt that the success would do a world of good to Japan football: “As coach said we have played six games in a short period of time. We had less day but Qatar had one day less than us to prepare and it will be tougher for them. So no excuses on our side and we will be trying to be in the best condition for the match tomorrow.